A trip on Highway 285 between Fort Stockton, Texas, and Carlsbad, New Mexico, is both fascinating and horrifying for the average commuter in the US desert Southwest. The 140-mile stretch of two-lane road can take hours to traverse on a given day as trucks hauling crude oil, sand, water, chemicals, and petroleum equipment overload the battered, sun-fried pavement. The mostly flat, dusty landscape is populated by drilling rigs, workover rigs, and gas flares as far as the eye can see. Even on the highway’s best day, most traffic laws are ignored as oilfield workers in pickup trucks race from site to site. The industrial chaos along the corridor serves as a snapshot of the now multiyear industry boom in the Delaware Basin and greater, 75,000-sq-mile Permian Basin. Keeping track of it all has become a massive challenge for operators, service firms, and midstream companies that make the basin move. They work in an environment that is changing daily, and they can’t afford to be caught by surprise when hydraulically fracturing a well, building infrastructure, delivering equipment to a remote area, or prospecting for new business. An emerging solution: an intelligent, continually updated view from above—or satellite imagery analytics. Companies such as Sourcewater, Planet, and Westwood Global Energy Group are stepping up to monitor the world’s busiest oil play by leveraging relatively inexpensive satellite technology and machine learning. Application of satellite imagery in the oil and gas industry is nothing new. It has been used by companies to monitor remote facilities. Market observers have used the technology to assess global oil supplies by tracking tanker traffic and storage levels. The World Bank has used it to estimate emissions from the flaring of natural gas and oil output by the Islamic State. The real breakthrough is in merging this capability with advanced analytics to aid planning for development, production, and logistics while providing competitor intelligence and market research. Development is still in the early stages as companies refine their models to produce the most reliable information possible, and products are just now being rolled out to clients. An early entrant in the satellite imagery analytics space, Sourcewater’s primary objective is to serve as an online data analytics platform and marketplace for oilfield water sourcing, recycling, and disposal. Founded in 2014 as part of MIT’s Energy Ventures program, Sourcewater “is really about providing oilfield water market intelligence” to its clients, which often are operators planning their completions and production work and logistics or midstream water companies determining where to add new capacity, explained Josh Adler, Sourcewater chief executive officer. Relatively new to the industry himself, Adler’s career path includes founding one of the Internet’s first matchmaking sites and serving as chief speechwriter to former US Treasury Secretary Paul O’Neill. Sourcewater generates market analytics and forecasts by gathering data from multiple sources, including its own marketplace of buyers and sellers, government records databases, market research through hundreds of calls per day inquiring about water and disposal price and availability, and Internet of Things sensors and SCADA systems that bring in real-time data such as frac pit levels, disposal pressures, tank battery levels, and truck locations. NOTE: Want a free demonstration of Sourcewater’s satellite imagery analysis and live satellite imagery feed? Click here to schedule yourself for a free tour. The company recently added satellite imagery analytics as one of those data sources. “We think there is a lot of predictive power and insight that can come from advancing satellite imagery analytics,” Adler said. In most cases, constructing a frac pit in Texas does not require a permit, removing the possibility of referencing public data to account for available water. So the best way to canvass the landscape is from above. 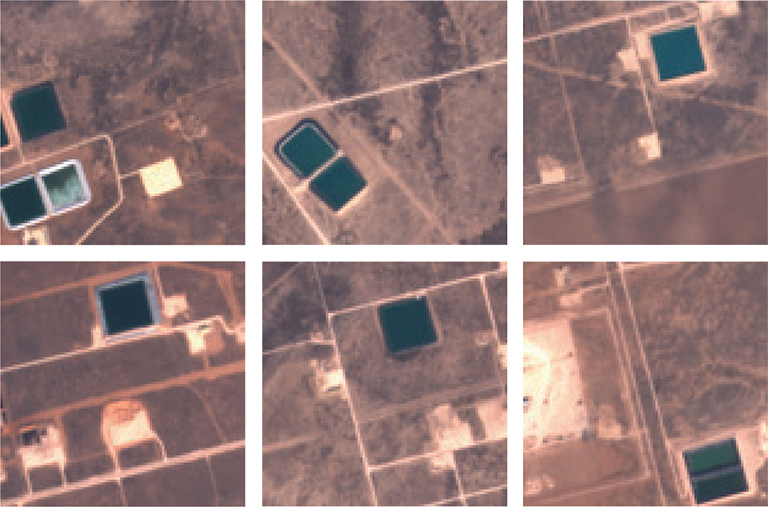 Sourcewater analyzed 11 satellite images of the central Midland Basin that were taken almost quarterly from early 2016 to about mid-2018 and not always easy to gather. “Even in the desert of the Permian Basin you would be surprised how many days are cloudy,” Adler said. While spotting water in the desert on a clear day is not difficult, the challenge comes in identifying and measuring water pits vs. other water features. The team developed a deep-learning model to process the images. It started by using object identification that considers size, shape, angles, visible and nonvisible electromagnetic spectra, and proximity to other relevant objects. “Frac pits tend be square and within a certain size range,” he said. Sourcewater broke down regional images into smaller grids to distinguish areas with ponds from those without ponds. Source: SPE 191743. Pits were matched with external data to identify surface and mineral owners and the operators that control the leases. Sourcewater then called each identified surface owner and operator to confirm the amount and type of water in each pit, the pit’s capacity and recharge rate, the owner’s asking price for water, and price, volume, and buyer details for any recent transactions. The model identified 8,298 frac pit instances over 3,600 sq. miles throughout the time series. The team was able to distinguish between freshwater pits and produced water pits based on certain characteristics of the spectral imagery of the water. The satellite images were examined alongside information on hydraulic fracturing activity obtained from IHS Markit based on FracFocus data on completions and water volumes injected. Best Predictor of New Drilling? Pleased with its frac pit results, Sourcewater mulled where else it could apply satellite imagery analytics in the oil field. “That is when we started looking at well pad activity. Because before you can drill a well you have to clear a pad,” Adler said. Pads are typically cleared 1–4 months before a rig is moved on site—meaning satellite imagery analytics could predict drilling up to 4 months before a spud occurs. The team acquired a Howard County, Texas, dataset containing drilling permits and spud and well completion reports from 1987 through mid-2018. It then examined well pad activity from 2016 to mid-2018 using the same 11 image samples that were part of the frac pit study. “As we tuned the machine learning, we got a closer and closer fit in comparing well pads we were detecting from the imagery” with drilling permits filed with the Railroad Commission of Texas (RRC), he said. The satellite’s first scan in January 2016 picked up 4,495 well pads and matched with RRC spud data dating back to 1987. Permit data showed 5,311 drilling permits were filed during that time period, which could mean up to 15% of permits either were not drilled or RRC form data were incorrect or lost. About 10% of spuds didn’t have a permit associated within 100 m, which also could have been from inaccurate data or lost records. For the period between early 2016 and mid-2018, the pad images indicated there was a spud within 100 m of the pad almost 90% of the time, consistent with spud reports and permit data. “So we’re doing a good job of finding the pads that are out there using our machine-learning systems. “What is not as good,” Adler said, “is our false positive rate. We are picking up features that are not well pads.” These objects, for example, can be harvested land on a farm, a road intersection, or a home or commercial construction site. Such stumbling blocks can be mitigated by applying additional layers of object identification to the machine-learning model, such as road maps, for example, because a well pad would not be in the middle of a state road. Digging deeper into the more recent dataset, meanwhile, the team decided to match the API numbers of the drilling permits with completions reports. Much to its surprise, it found that, 25% of the time, a permit was filed after the well was already drilled—“sometimes months later,” he emphasized. On average, a drilling permit was filed 16 days after the well was spudded. Five percent of the time there was no API number matching a permit to the spud, possibly caused by an error in the API number entry, lost files, or the data simply were not published online. 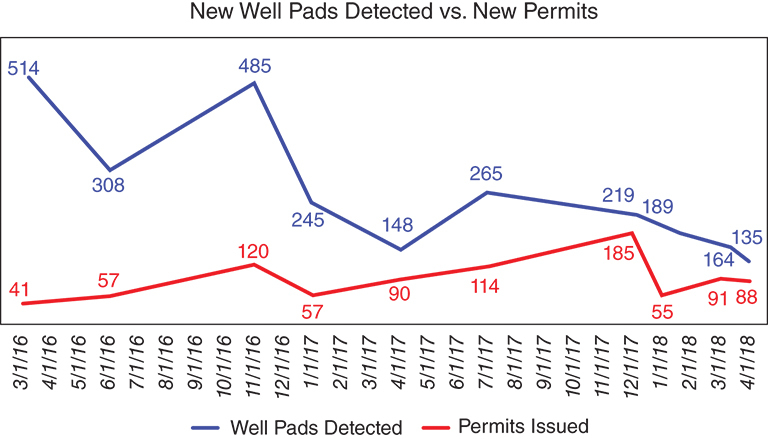 As Sourcewater trained its well pad model, the number of well pads detected aligned more closely with RRC permit data. However, in the end, not all well pads had a matching permit. Source: Sourcewater. Now the question is whether Sourcewater can reduce its false positive rate to a level that provides a more reliable drilling predictor in place of permitting data. “We had some very good preliminary results, we’re continuing to refine those, and we hope to have a product launched very early in 2019,” Adler said.